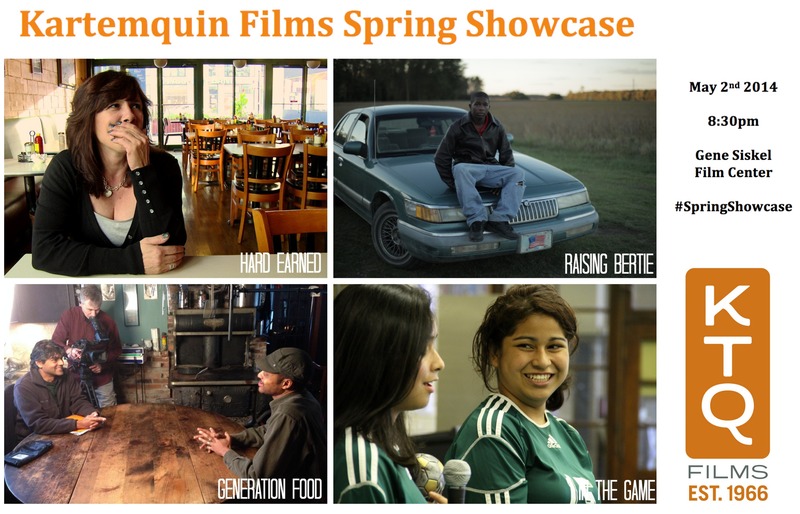 The 3rd annual Kartemquin Spring Showcase invites you to enjoy exclusive previews of never-before-seen footage from four of our upcoming documentaries, and give your feedback directly to the filmmakers in the theater and in a post-screening reception. Serving as both a window into our process and an opportunity to impact the future of these works-in-progress, this event embodies the Kartemquin spirit of collaborative creation and meaningful audience engagement. Gene Siskel Film Center at the School of the Art Institute of Chicago, 164 N State St, Chicago, IL. Tickets $11, GSFC Members $6. For the last two years the Spring Showcase has sold out quickly, so we recommend you buy tickets in advance. The featured projects this year tackle issues such as the world's food system, living on low incomes, the ups and downs of a girls' high school soccer team, and rural education, and will offer an exclusive and unique opportunity to see new works in-progress brought to you by award-winning directors including Steve James (The Interrupters), Maria Finitzo (Terra Incognita: Mapping Stem Cell Research), and Margaret Byrne (editor/camera on American Promise), plus our major new six-part series produced by Maggie Bowman (The Calling) with stories directed by Katy Chevingy (E-Team), Ruth Leitman (Tony and Janina's American Wedding), Joanna Rudnick (In the Family), Maria Finitzo (5 Girls), and Brad Lichtenstein (As Goes Janesville). Director: Steve James. Writer/Producer: Raj Patel. Producers: Rachel Wexler, Julie Goodman, Cynthia Kane, Gita Saedi Kiely. With a billion hungry and two billion overweight people on Earth, everyone knows that the food system is broken. But few people understand that it’s a system, with rules that keep things ticking along. Investors and corporations make millions. Billions suffer the consequences. But a few groups are breaking the rules of how we eat today, so that everyone can eat tomorrow. Steve James (The Interrupters, Hoop Dreams, Life Itself) and Raj Patel (Stuffed & Starved, The Value of Nothing) weave together tales of the system’s destructive creators and creative destroyers, bringing together traders, farmers, grocers and eaters from India to Malawi to Maine to Oakland to show not only how the system works, but how some unlikely people are transforming it. Discussing the project live on stage: Steve James and L. Anton Seals (Community Engagement Specialist, Eat to Live Garden and Farm). 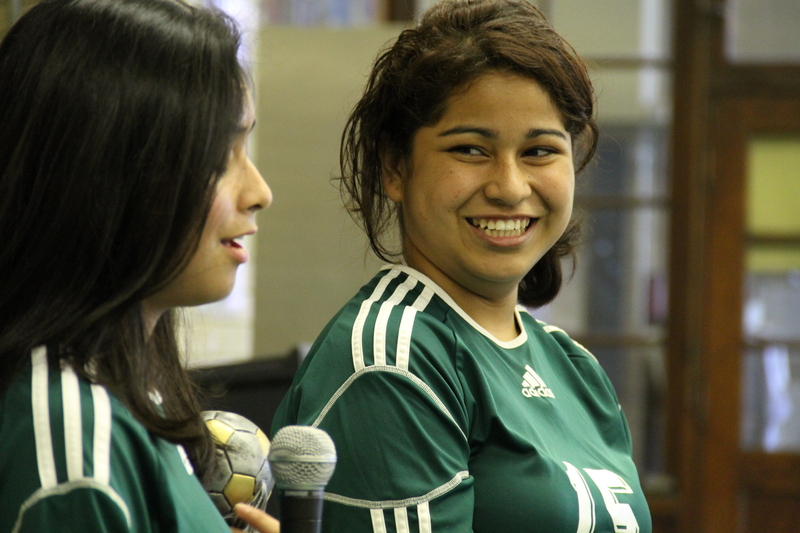 In the Game puts on human face on how race, gender and class impact on life opportunities by following the personal story of a soccer coach and the young women he is committed to helping. Originally conceived as a film about the legacy of Title IX and all that is left unfinished in the fight for gender equity, In the Game has instead emerged as a film about the complexity and resilience of Hispanic girls, forced to confront all that life throws their way, as they endeavor to create for themselves the opportunity for a better future. Discussing the project live on stage: Maria Finitzo (producer/director), Mary Morrissette (producer), and Margaret Stender (President and CEO of Chicago Sky, Co-Owner & Leader of Academy Operations at Flow Basketball Chicago). In Raising Bertie, we follow three young men over the course of five years as they grow into adulthood in Bertie County, a rural African American-led community in North Carolina. Through their stories, we see the issues facing America’s rural youth, the repercussions of a woefully underfunded rural educational system and one woman’s fight to change the outcome. 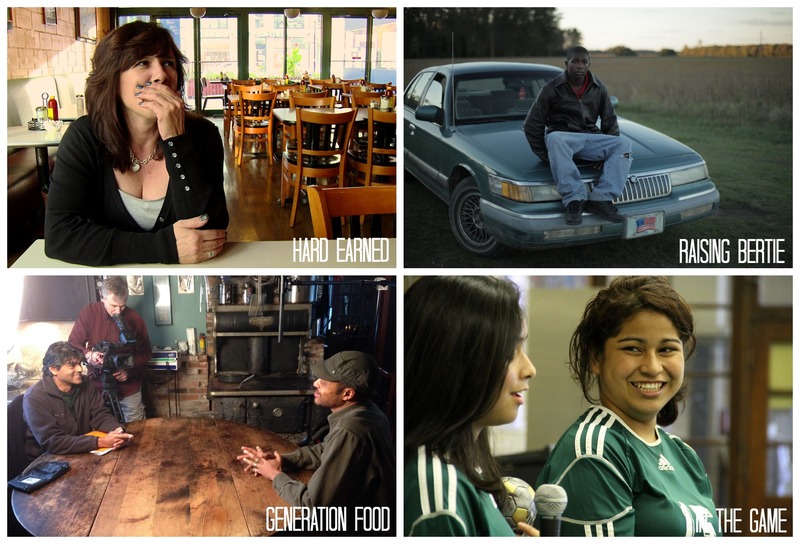 Hard Earned, a six-part documentary series for Al Jazeera America, puts aside economic debates and follows five families around the country to find out what it takes to get by on eight, ten or even 15 dollars an hour. The series turns an intimate lens on this group of 21st century American dreamers. They fight against all odds to thrive, when it takes everything they have to simply survive. This event is inspired by our regular KTQ Labs: Feedback Screenings Program. KTQ Labs is a monthly program that gives local documentary filmmakers a chance to screen their works- in-progress and receive constructive feedback from Kartemquin staff and associates, free of charge. The wait-list is often six months long with filmmakers eager to receive feedback. KTQ Labs has helped over 100 films progress towards completion, some of which have gone on to screen at festivals such as SXSW, Hot Docs, and True/False, and to air on PBS Independent Lens and the Sundance Channel. Notable program graduates include Louder Than A Bomb, What’s the Matter With Kansas?, Scrappers, Hairy Who and the Chicago Imagists and Andrew Bird: Fever Year. Interested in applying? Email KTQLabs@Kartemquin.com.